At The Giraffe House Wildlife Awareness centre we provide easy access to some of Africa's wonderful wildlife and bird species. 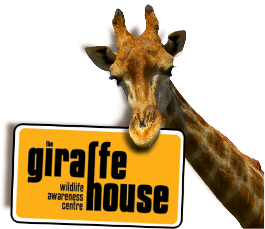 Focusing on African wildlife, Giraffe House aims to provide a place for people to enjoy the outdoors, whilst experiencing and learning about animals and why they are special. An important member of our team is Gerry, our hand reared giraffe. Did you know that giraffes can reach almost 6 m and are therefore the tallest land mammals on earth? Gerry is joined by some other animal friends that have been selected to form part of our wildlife educational programs. Education is our primary focus, and we cater from preschool and school groups to older groups. The wildlife education is presented in an informative wildlife conservation program suited for the individual group. We are open to general public. Our interactive creepy crawly encounters are held at 11:00, 13:00 and 15:00 on weekends and during school holidays. It gives the visitor the opportunity to meet and hold some interesting creatures. Coming from Cape Town or Paarl on the N1, take the Exit 39 off-ramp of the N1, turn right onto the R304 (Klipheuwel/Stellenbosch road) towards Stellenbosch, first left onto the R101 (Old Paarl Road towards Paarl) and then follow our signs. 15 Hectares of land situated close to the N1 and Stellenbosch. Only 39 km from the centre of Cape Town. Only a refreshment kiosk is available, but no restaurant. Kiddies' party options available. See our Party Information Form on the home page. Our lapa is a 100 square metre thatched roof lapa with drop down sides. This is available for kiddies' parties, functions and talks. Prior bookings are essential. The play area consists of 3 jungle gyms and a lawn area. Some animal food is available to treat the animals with. Some of our animals might interact with you, but we do not encourage any forced interaction with them.